Who is the enigmatic Mr Smyth? 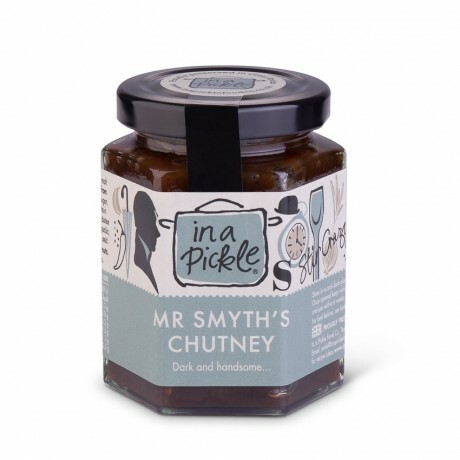 All we’re saying is that he's such a pickle fan we made him his own tall, dark and handsome chutney, a traditional combination of fruits, vegetables and spices. This is what we call our good all rounder - great in a ploughman's, on a cheeseboard or with cold meats. Available to buy in a quantity of 3 jars, or if you prefer you can swap the second and third jars for something else from our range of chutneys, pickles and relishes. Apples, malt vinegar (contains barley, e150c, caramel), sugar, onions,sultanas,raisins, dates,garlic, ginger, chillies, salt. Contains barley and may contain traces of nuts. Suitable for vegans.